How did HEC Montr�al's new mail installation handle the spam and virus explosion of early 2004? The May 2004 issue of Linux Journal features an article that discusses the large-scale mail installation we did at HEC Montr�al at the end of 2003. The present article describes how the system handled the recent e-mail worm explosion. It provides relevant information and statistics about the efficiency of unsolicited bulk email (UBE) prevention and virus protection policies now in place at HEC Montr�al. HEC Montr�al is Canada's first management school, founded in 1907. Over 11,000 students and 220 career professors are active every year. Furthermore, each student that graduates from HEC Montr�al is provided with a lifelong e-mail account; over 35,500 accounts are active to date. As with many organizations, the e-mail infrastructure at HEC Montr�al is a critical component that cannot perform at anything less than optimal functionality. As this article explains, the new infrastructure not only excels in performance and stability, but it also allows HEC Montr�al to save money. Thus, it benefits from an accelerated return on investment (ROI). Emmanuel Vigne, Information Director at HEC Montr�al, put it this way:"Without the new mail infrastructure, we likely wouldn't have survived the recent e-mail worms crisis. We probably would have closed all servers in order to limit the damage. With the new infrastructure, we went through this crisis without issues or outages. Our network analysts can now focus on developing tools to manage more efficiently the infrastructure, as they are no longer always fixing issues with regard to the mail servers." The implemented solution was based mostly on open-source components. A total of 11 servers, mostly IBM xSeries, and storage array networks (SAN) are used in the new infrastructure. Figure 1 depicts the architecture of the implemented solution. Postfix: A fast, easy to administer, secure and scalable mail transport agent. 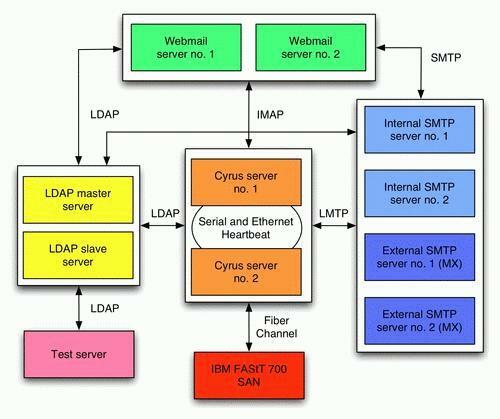 Cyrus IMAP Server: IMAP, POP3, Sieve services and message storage management. SquirrelMail: Complete Web mail system, slightly adapted for the specific needs of HEC Montr�al. OpenLDAP: Directory services for user management, authentication and more. To get a full description of the implemented solution, please refer to the May 2004 edition of Linux Journal. Although UBEs continued to grow at an alarming rate, at the beginning of 2004, we also have seen of e-mail worms. Those worms spread themselves over the Internet as attachments to infected mail. The attached files are all Windows portable executable (PE) EXE files affecting various versions of Microsoft Windows. Table 1 describes some of the most popular e-mail worms we have seen in the first three months of 2004. MyDoom.A MyDoom.A, also known as Novarg, had the most impact at the beginning of 2004. Once it has infected a computer, the worm uses its own SMTP engine to send files (while harvesting the addresses found in those files) with the following extensions: asp, dbx, tbb, htm, sht, php, adb, pl, wab and txt. The worm also contained a backdoor function programmed to launch a Denial of Service (DoS) attack on www.sco.com on February 1st, 2004, by sending HTTP GET requests every millisecond to port 80 of the attacked site. MyDoom.A also has two well-known modifications, MyDoom.B and MyDoom.E. The first one is similar to MyDoom.A, but it also carries out a DoS attack on www.microsoft.com and replaces the standard Windows host file with its own to prevent access to domains of anti-virus software companies. Finally, MyDoom.E (also called MyDoom.F) is similar to MyDoom.A; it also is programmed to carry out a DoS attack on www.microsoft.com and www.riaa.com. In addition, it searches for more file extensions in order to send copies of itself and randomly deletes files with avi, bmp, doc, jpg, mdb, sav and xls extensions. Bagle.A Beside replicating itself with its own SMTP engine (with harvested e-mail addresses from various files), Bagle.A also opens a backdoor on port 6777 to listen for commands (allows an attacker to download files and execute commands on the infected computer). Similar to its predecessor, Bagle.B opens a backdoor on port 8866. Bagle.C, Bagle.D and Bagle.E are mostly identical: they all open a backdoor on port 2745 and block anti-virus database updates by terminating update processes from a list of well-known vendors. Finally, Bagle.F is similar to Bagle.C, but it also propagates to P2P networks. NetSky.C Like the first two worms, NetSky.C searches for files with many extensions and harvests e-mail addresses from them. It then sends a copy of itself to these addresses--using its own SMTP engine--directly to the message's recipient server. If it fails, it uses a list of predefined SMTP servers. NetSky.D, also known as SomeFool, is similar to NetSky.C but is programmed to delete MyDoom from the infected machine. As you can expect, those viruses make a huge economical impact, calculated in terms of help desk support, overtime payments, false positives, bandwidth clogging, transient storage consumption, productivity erosion, management time reallocation and cost of recovery. Various industry estimates speculate that global businesses lost $55 billion in 2003 due to viruses, up from $30 billion in 2002 and $13 billion in 2001. Other research papers show that a typical user spends 4.4 seconds taking action against an e-mail. As an example, if we take the 25 most-spammed employees at HEC Montr�al and set the average annual salary at $46,618 CAN, we can proceed with an estimate of productivity cost for the first three months of 2004. Table 2 shows the cost worksheet. Some analysts quantified the annual cost of spam at $8.9 billion for US corporations and $2.5 billion for European businesses in 2002. In 2003, the numbers increased and reached $10 billion for the US and over a $1 billion for Canada. This tendency most likely will continue, and some estimate that over 8.8 billion UBEs will be sent daily in 2004, compared to 7.3 billion in 2003 and 5.6 billion in 2002. "Our library director can now efficiently use his e-mail account. Before the new system was put in place, he was receiving hundreds of spam every week. Going through his e-mail during the day in order to respond to student requests was relatively painful and the associated productivity erosion was high", said Emmanuel Vigne. Nevertheless, although tallying the true cost of spams and viruses is relatively hard, HEC Montr�al certainly saved money by reducing the loss of productivity of its employees due to UBEs and e-mail worms. RBL: Message rejected by a real-time blackhole list. RHSBL Client: Message rejected by a right-hand side block list. Header Date: Message has a date from the distant past or future. Header Subject: Message rejected by suspicious subject. Header X-Mailer: Message rejected by suspicious mail user agent. Header Content-Disposition: Message rejected by suspicious attachment. Header Content-Type: Message rejected by suspicious attached file. The filter method specifies the file extension. Body: Message rejected by suspicious body content. Access Username: Message rejected by access username. Virus: Message rejected by AMaViS together with the anti-virus solution used. Spam: Message rejected by AMaViS together with SpamAssassin. Various other summaries (warnings, fatal errors, panics) and more. Using those two tools and some custom Perl scripts, we produced the different figures found in this article. 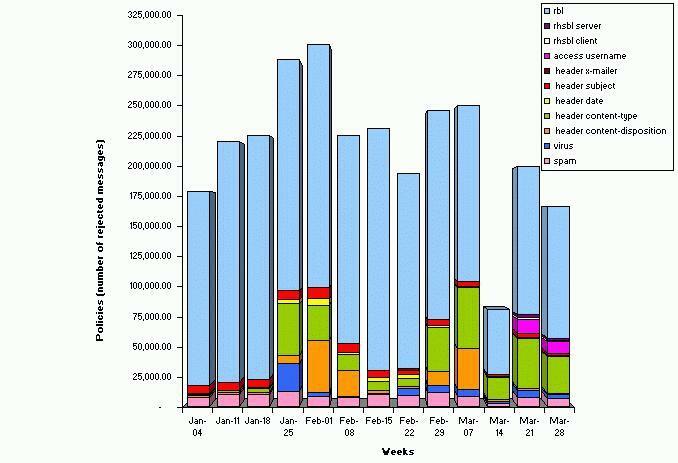 Figure 2 shows the weekly total number of mail considered to be UBE or containing viruses that were blocked since the beginning of 2004. The rules' efficiency also is shown in this figure. As shown in Figure 2, the RBL policy is definitively the most effective one, followed by content analysis using SpamAssassin and message Subject header analysis. You also can note that the virus policy numbers are not as high as expected. This is easily understandable as the detection of viruses often is moved from AMaViS to Postfix's header checks (Content-Disposition, for example). This requires considerably less system resources, because we avoid both detailed analysis in SpamAssassin and a process fork, for each received message, for virus scanning using NAI VirusScan. The network analysts proceeded with such modifications after the 01-25 week for the MyDoom e-mail worm. 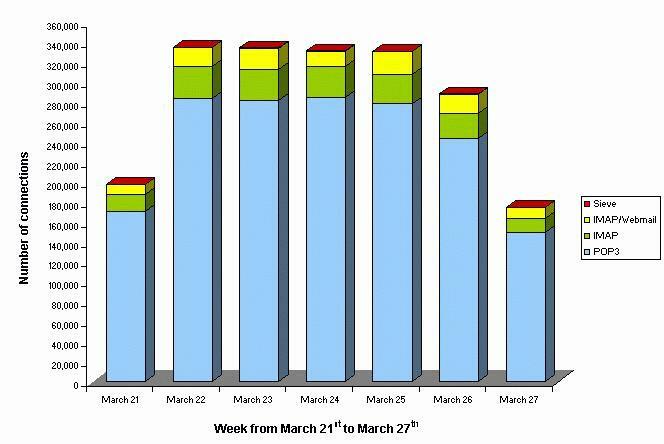 Furthermore, Figure 3 shows the usage of services offered by the mailstore, during the busiest week of the first three months (March 21-27). As shown in Figure 3, POP3 is the most solicited service, followed by IMAP and the Web mail system, which also uses IMAP but was separated in the figure. During this week, peeks of 52 POP3 and 338 IMAP concurrent connections were observed coming from a total of 11,000 different users. The mailstore also is responsible for message deliveries in the user's mailboxes using the Local Mail Transfer Protocol (LMTP). Peaks of 75 concurrent delivery processes often were seen. 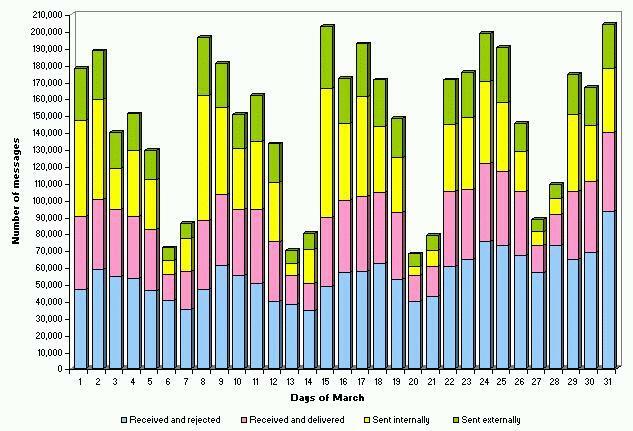 On the other hand, Figure 4 shows the amount of mail exchanged using the four SMTP servers for the entire month of March 2004. As shown in Figure 4, 40 to 60% (55,000 messages per day, on average) of all received mail was rejected by various UBE and virus filtering techniques. This number actually is down from 80% in December 2003. At that time, HEC Montr�al was receiving more than 125,000 spams per day. Currently, the average number of messages sent per day is 57,000, while the average number of received (from external servers) and delivered email per day is 35,000. As you have seen from the different figures, the mail infrastructure certainly is a key component at HEC Montr�al, as it is highly solicited. Overall, the mail infrastructure has been very fast and stable since it was deployed. Minor updates were performed by network analysts, mainly to keep up with the new e-mail worms. The new mail infrastructure helped HEC Montr�al manage the e-mail worm crisis we all went through at the beginning of 2004. It also continues to efficiently limit the delivery of UBEs. According to the Call Center Team, "We have noticed an important decrease in calls regarding problems with the mail infrastructure, spams or viruses. This is especially true for computer viruses, as we are offering first level support if they get infected. On the other hand, some are actually calling to be sure we haven't blocked legitimate e-mail. Pushing forward the use of Spamity to users likely will help us in reducing the number of calls. Finally, some users also called to praise the speed, the stability and the efficiency of the new infrastructure." I would like to give special thanks to Dominique Duc for helping me with the various charts in this article and Chris B. Vetter for reviewing the content. Ludovic Marcotte (ludovic@inverse.ca) holds a Bachelor degree in Computer Science from the University of Montr�al. He currently is a software architect for Inverse Inc., an IT consulting company located in downtown Montr�al. If their services are anything like ours, their graph of service utilization doesn't clearly represent the real use of their IMAP services. A POP3 user will typically poll the server regularly, causing a connection to be logged each and every time, where it's not uncommon for IMAP users to remain connected throughout the day, showing only one connection initated. For IMAP utilization, it is usually more interesting to look at the number of concurrent POP and IMAP connections, as this often more closely reflects the real load on the server. Of course, I could also be entirely wrong about how they're graphing their results. � 1994-2004 Specialized Systems Consultants, Inc. (SSC) publishers of Linux Journal.